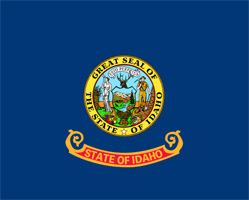 Idaho is the 43rd US state located in the Pacific Northwest region. The capital of Idaho is Boise. According to the 2008 census, Idaho has a population of 1,523,816. It is also known as the ‘Gem State’, for almost every known gemstone can and has been found in here. High amounts of lead, silver, antimony, cobalt, phosphate, garnet, zinc and mercury have been discovered in the Idaho state. The natives of Idaho are referred to as Idahoans. Agriculture is the major source of income in this state. Idaho produces 1/4 of the nation’s potatoes, corn, apples, wheat, barley, hops and sugar beets. Although Idaho is a ‘lesser known’ state, there are many things you can do and many places to visit while in Idaho. When you’re in Idaho, make sure to visit the Idaho Potato Museum, American Indian cultural centers, Boise River, Snake River, Idaho Botanical Garden and the Old Idaho Penitentiary. Idaho is mostly mountainous, and land locked on all sides, surrounded by the states of Wyoming, Montana, Washington, Nevada, Oregon and Utah. Idaho is highly known for its outdoors activities and sports. Idaho is where the world’s first chair lift was mounted. White water rafting and kayaking are among Idaho’s most popular pastimes. Apart from this, other activities you can do are biking, hiking, boating, golf, snowboarding, skiing, camping, and fishing. Idaho is also home to many popular ski resorts that are populated during the winter season. Because of this, the state is highly visited especially during the snowy season.